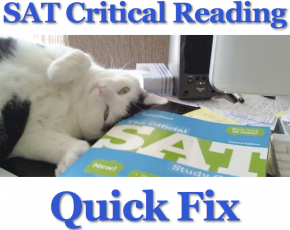 SAT Success Secrets tutoring services are customized to best support your needs. I am so confident of the value you will receive that I don’t require a contract or predetermined length for the tutoring relationship. How long you stay is entirely up to you. That being said, something magical happens when you “throw your hat over the fence” and commit to a course of action. For that reason, if you purchase a tutoring package, I guarantee the result. Whether you decide to purchase a package or work with me on a week to week basis, my suggestion is that you make a personal commitment to at least 12 2-hour sessions. While some students see extraordinary results in as few as 4 – 6 sessions, it takes most students more time to see such gains. Students typically do 1 or 2 sessions per week.